Culture Freedom – Backing vocals. Wise Intelligent – Lyrics and lead vocals. Donald Adams – Bassline on ‘Rappin’ Black’. Lego Man – Vocals on ‘Easy Star’ and ‘Just Servin’ Justice’. Long Man – Vocals on ‘Easy Star’ and ‘Just Servin’ Justice’. Schooled in the New Jersey capitol of Trenton – infamous for the riots that followed the murder of Martin Luther King Jnr. – the Poor Righteous Teachers first made their mark with pro-black activism ‘Holy Intellect’ LP: a year after their foundation. On a wave of black consciousness, the trio found a common, congruous relationship with fellow east coast artists, X-Clan, Brand Nubian and Yz. Like their compatriots, they too preached the, provocative at times, knowledge of the Nation of Islam; or to be precise, the concomitant off-shot, Nation of Gods and Earth. Also referenced to as the ‘5% Nation’, this Black Nationalist, and Islamic group was formed by Harlem’s Clarence 13X – one-time student of Malcolm X. Clarence’s doctrine applied the following logic, that the population could be broken-down into demarcated percentages: 10% of the people know the truth of existence but keep it from the 85%, the self-titled 5% are those who know this truth but want to enlighten the rest. 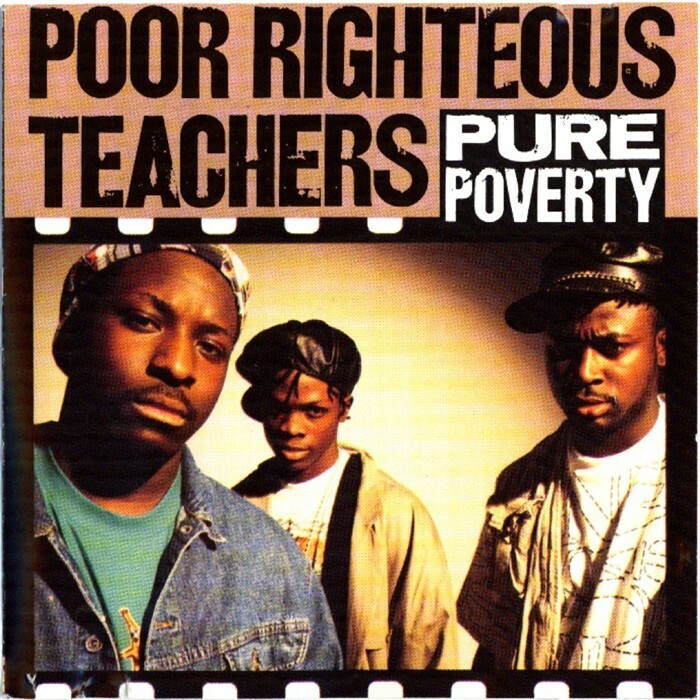 Though the agenda was important, and their vital message needed to be spread, the Poor Righteous Teachers released some less then vociferated scripture themes; especially with their second, modestly successful, single ‘Rock Dis Funky Joint’. It’s the second long-player, ‘Pure Poverty’, that made the most impact with yours truly. Sporting no less then three singles, ‘Shakiyla’, ‘Strictly Mash’ion’ and ‘Easy Star’; ‘Pure Poverty’ mashed-it-up by mixing together Afrocentric Hip Hop, dancehall, ska, reggae and touches of Soul II Soul over 13-tracks. Founder and lead MC, Wise Intelligent’s vocals skipped, and rapidly shot out syllables in a spittle toasting style – usually without drawing breathe – helped by group member Culture Freedom and guest, burring, ragamuffin’s Long Man and Lego Man. Tracks such as the bounding Caribbean flavoured ‘Easy Star’ – that actually uses parts of the heavy acid rock band Iron Butterfly’s ‘In-a-gadda-da-vida’ – ‘Strictly Mash’ion’ – Bob Marley’s ‘Them Belly Full (But We Hungry)’ supplies the backbone – and ‘Rappin’ Black – “From a poor family/just like Jesus” – all demonstrate this mix of aesthetics. Other notable cuts include, perhaps one of my all-time choice tunes, ‘Methods Of Droppin’ Mental’. Street preaching mysticism is laid-down over The Soul Searchers’ ‘Ashley’s Roachclip’, and break beat drums of Afrique’s ‘House Of Rising Funk’; whilst a soothing charmed flute beckons us to absorb the PRT’s poetic chatting; and metaphorical lyrical fables: “Snakes in the meadow/grass cut low/when snakes head show/the snakes head goes/See I don’t eff around with no snake that’s out to eat me/greets, then he beats me/for something I created”. Meanwhile ‘Each One Teach One’ kicks in with the funky drum break from Bill Withers’ ‘Kissing My Love”, and features Wise Intelligent’s drilling, rolling vocals, and their attack on the one-time slave owners broken promises, “None of us own forty acres/not one of us owns mules”, and the white-washing of Jesus image, “Jesus Christ is known to some/symbolic to the gods/Was an original man/until today he has blond hair and blue eyes”. A a cappella rounds off ‘Pure Poverty’. Wise with just the backing track audible from his headphones, and with some reverb, eloquently raps a dexterous soliloquy, that sounds spontaneous and improvised – a perfect way to show he got the skillz. There’s plenty of beat-junky treats and rapping highlights throughout the New Jersey preachers LP. It succeeds in amalgamating a whole vista of styles, falling in-between the boundaries of both toasting and Hip Hop. Unfortunately ‘Pure Poverty’ failed to alight the black music charts, selling fewer copies then its predecessor, ‘Holy Intellect’, and eclipsed by the fortunes of their third album, ‘Black Business’. After a three-year hiatus in 1993, the group brought out the establishment-bashing ‘The New World Order’, before disappearing off the radar. However, in 2001, a collection of both rare and unreleased material surfaced under the, aptly, entitled ‘Declaration Of Independence’: a revaluation of sorts, and justifiably so.